When 'the stripe' came back I nearly died. I was immediately taken back to grade 6 or 7 when I used to rock a pair of wide leg denim with a black and white stripe down the side nearly everyday I loved them so much. My memory can be pretty terrible but those pants are a piece from the past that I never forget about! I remember 10 years later even thinking about them and wondering what the heck was going through my head with those pants and that hideous stripe. Like why was that stripe even necessary? Well lo and behold, as I should have known because it's fashion, that stripe came back and I WAS IMMEDIATELY INTO IT even given the horror of my flashback!!! The stripe in the pants I've styled in this post are very subtle being navy on a black pant but I LOVE a classic black stripe on white pants. 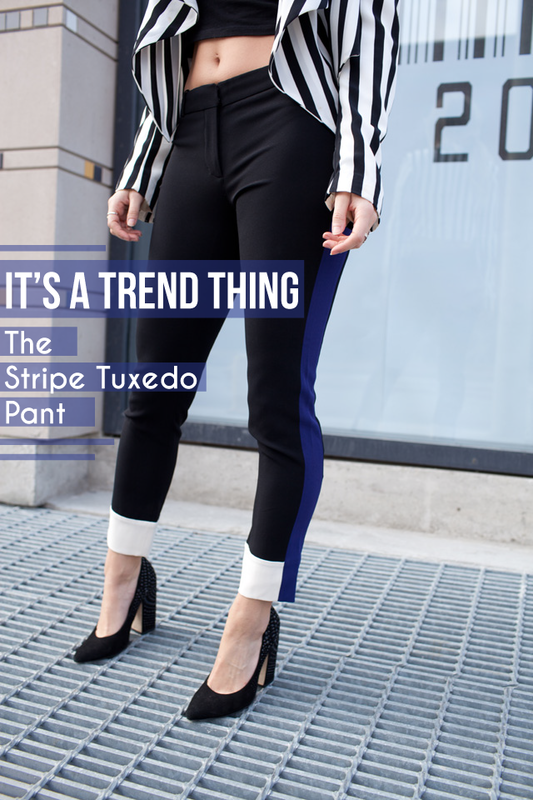 I think I'm trend struck by the stripe tuxedo because it has an athletic look, like a track pant in a way, that I'm huge into right now. Check out more styling inspiration on my Pinterest Trends Board. This is the perfect look! I love those two bold pieces paired together.